USA vs. England. Representative Democracy vs. Constitutional Monarchy. The Colonies vs. the Homeland. Color vs. Colour. Fries vs. Chips. The USMNT heads across the pond to face the English who had themselves a nice little World Cup (what’s that?) finishing in fourth place after winning the hearts of a nation like a Hugh Grant romantic comedy. This is the first is a series of two stern European tests (we face fellow non-World Cup participants Italy in Belgium on Tuesday, 11/20) for the youngster MNT. Their last European Vacation saw them tie eventual World Cup winners France and fall to World Cup missers Ireland (ok). Both matches will close out a 2018 to (mostly) forget, but hopefully usher in a brighter era in 2019 on the way to 2022. Manager Dave Sarachan (correct…. we still don’t have a head coach) has done a serviceable job filling in the interim and called in loads of fresh faces, domestically and Euro-based, to keep us looking over the horizon to brighter days. 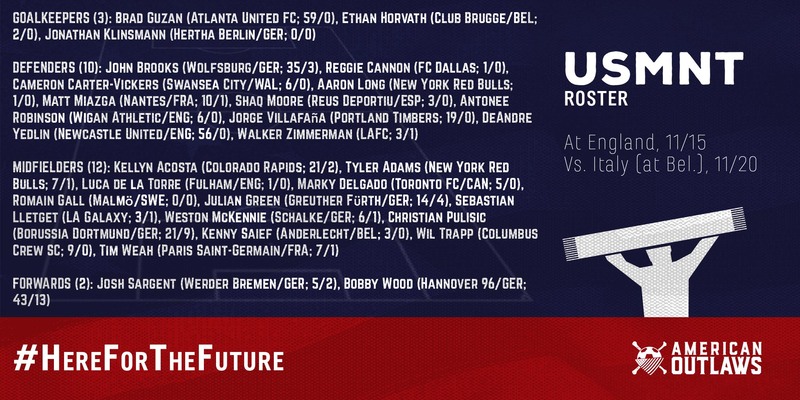 Christian Pulisic makes his return to the fold, his first minutes for the Nats since May. Zach Steffen pulled out of the roster so it is likely that Ethan Horvath will get the start between the sticks. England rolls out a roster with 16 players from their summer adventures and Wayne Rooney gets will get his 120th and final cap. Put on your tri-cornered hats, dust off your best Revolutionary and 1812 jokes and get your local AO chapter.